Global Biometric Sensors Market Report, published by Variant Market Research, forecast that the global market is expected to reach $1,820 million by 2024 from $868 million in 2016; growing at a CAGR of 9.7% from 2016 to 2024. By geography, Rest of the World (RoW) and Europe are expected to grow at a CAGR of 11.9% and 10.2%, respectively, during the forecast period. The global biometric sensors market is majorly driven by innovative features of biometric sensors such as light weight and compact design, and growing demand for fingerprint identification in tables, smartphones, and other electronic devices. Moreover, increasing demand for fingerprint scanning biometric sensors in banks and offices, and rising adoption of stronger security systems across various industry sectors would provide several growth opportunities for the biometric sensor market in the coming years. The global biometric sensors market is categorized into type, application, and end user. Type segment includes ultrasound sensors, thermal sensors, optical sensors, capacitive sensors, and electric field sensors. The biometric sensor market by application is categorized into finger scan, hand scan, vein scan, voice scan, facial scan, iris scan, and others. Finger scan accounted for the largest market share in the overall application segment in 2016, driven by rise in demand for data security and growth in cases of identity theft. However, the voice scan segment is anticipated to attain the fastest CAGR during the forecast period 2016-2024. Furthermore, by end user, the market is bifurcated into defense & security, consumer electronics, medical & research labs, banking & financial services, commercial centers & buildings, and others. Commercial centers & buildings dominated the end user segment accounting for around one-third of the global market share in 2016. 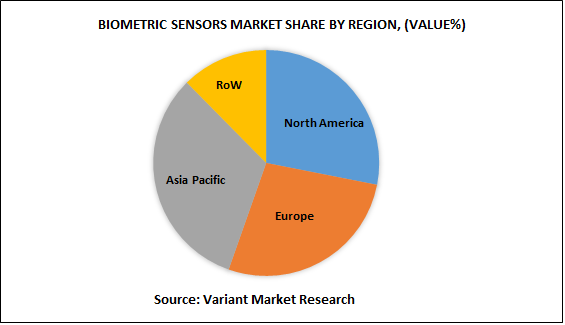 Geographically, global biometric sensors market is categorized into North America, Europe, Asia-Pacific and Rest of the World (RoW). Asia-Pacific accounted for the largest market share of 34.2% in 2016, owing to rise in adoption of biometric sensors across various industries such as, IT & telecommunication, banking, financial sector and others. North America accounted for the second largest market share of 28.8%, driven by technological advancement and rising application of biometric technology in commercial sectors and international airports. In terms of growth, RoW is expected to attain the fastest CAGR of 11.9% during the forecast period 2016-2024. The growth would be primarily seen due to the increasing penetration of smartphones and other biometric based electronics devices in countries such as Japan, China, and India. 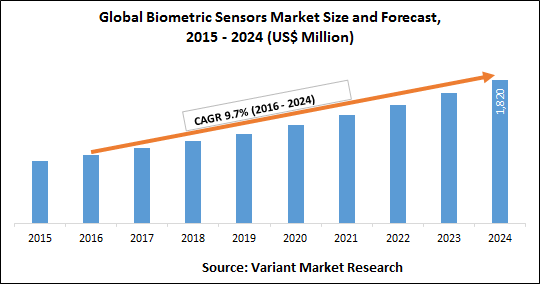 Major companies operating in the biometric sensor market are Infineon Technologies AG, ZKTeco Inc, NEC Corporation, 3M, Precise Biometrics Ab, Safran, CrossMatch Technologies, Inc., IDEX ASA, Fulcrum Biometrics, and Suprema Inc., among others.